We are not warriors. We are a grove of trees. January 7, 1895, the slopes of Lē‘ahi: Everyone waits for the sound of gunfire to echo in the darkness before the sun rises. The ground is soft and uneven after last night’s rain. Koa are ranged along the wrinkled flanks of the mountain in the gloom before dawn, crouching behind stones for cover. The faint light plays tricks, and swells the size of their force to four hundred or even four thousand. Some converse nervously in small groups, while others murmur quiet jokes to each other, others hum the tune to the mele ‘ai pōhaku as they lean out from cover, peering down at the dark shore below. Kānaka from the countryside kneel next to Chinese plantation workers and haole merchants. Snatches of whispered Greek and Japanese float on the wind, mixing with the low murmur of Hawaiian. A squad of police had surprised Bertleman and the others at his house in Waikīkī yesterday. Wilcox and Lot Lane led a force of seventy men to rescue them, but the rebellion was no longer a surprise. It had come to light a day too early. Now there is no choice but to fight, so as the dawn casts light on the Republic’s forces encamped below, the slopes of Lē‘ahi light up with rifle fire, the sharp cracks of their Winchester repeaters interspersed with the booming retort of a howitzer. Cries of “aloha ‘āina!” and the queen’s name punctuate each pull of the trigger, even though the koa know that a betting man wouldn’t take their odds. The government’s forces are better armed, better funded, and better trained. But they also know that if by some chance they can defeat the PG, they can proclaim the constitution they had written and reinstate Lili‘uokalani. Each one continues to fire. The koa aloha ‘āina have the advantage of the high ground and the stones of the land to protect them from the soldiers below. They bellow and whoop as the PG forces begin a hasty retreat. After a moment of reflection, the koa press their noses together and share their ea with each other, as they know that they will need that breath for the fight yet to come. June 24, 2015, the slopes of Mauna a Wākea: The sun is high overhead, but not much light filters through the mist. Sound is dampened in the heavy curtain of white. It is more substantial than noe, maybe something we would call uhiwai, hanging heavy on the ground. Muffled thuds hum through the thin air as rocks and boulders are rolled onto the dark volcanic soil of the road. Ea rises from each of the stones. Four hundred, four thousand, forty thousand shadows glide through the white veil in the shape of humans. Or maybe ancestors. A hand here. A set of arms there, carrying pōhaku. Reinstating them as guardians of our land. 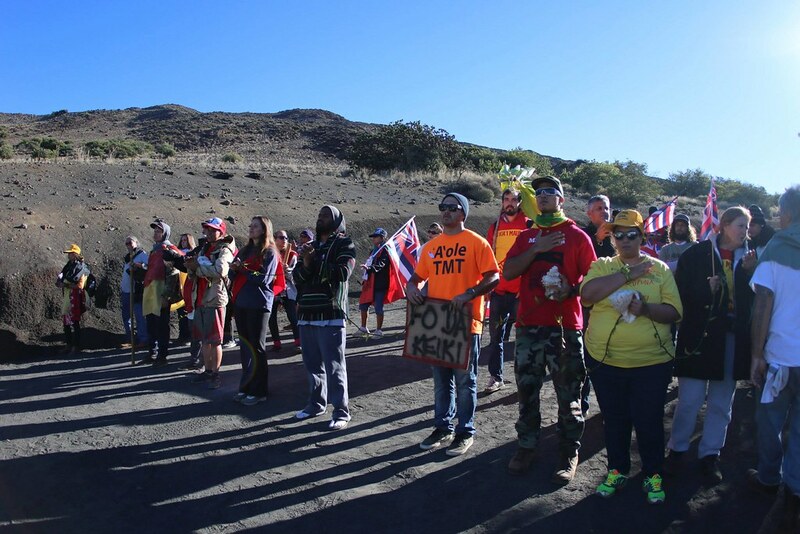 The wind carries cries of “aloha ‘āina!” and the sound of chanting from below, as seven hundred koa block the progress of the TMT construction trucks. They know that it is a hard fight ahead, bodies and aloha and imagination against money and mistaken notions of progress. Kahoʻokahi has lain himself upon the ground, connected completely to the ‘āina, blocking their way, hoping that those who drag him away will be touched even momentarily by that relationship to the land. Wailing and defiance resound on the mountain as twelve are arrested. The only sound in the uhiwai, though, is the heartbeat thump of stone connecting to earth. Walls to protect people from their own folly. Stone seeds planted for koa to grow. Despite its early victory on the slopes of Lēʻahi, the 1895 uprising ultimately failed in its immediate goal of restoring Liliʻuokalani to the throne. They had the capable leadership of Sam Nowlein and Robert Wilcox and a sound strategy for a quick coup, but their plot was discovered and they had to launch their offensive before everything was in place. The koa were unable to defeat the government’s forces and instate the new constitution that Charles Gulick had drafted at Nowlein’s request, but they laid the groundwork for the continued resistance that was to come. 331 people were arrested in conjunction with the uprising, and they were proclaimed by the people to be the “koa aloha ʻāina,” often translated as aloha ʻāina warriors. Warrior is a common translation for koa. People who fight in battle are warriors, so we often describe ourselves as warriors when we stand up against oppression. People who have lasted long in business are also called warriors though. Someone who runs a muddy obstacle course is a warrior. Hawaiians are a warrior culture. The University of Hawaiʻi football team’s mascot is the warrior (though no longer rainbow warriors). But as with so many things connected with our culture, and even other indigenous cultures, there is a translation issue here. Warriors are trained in warfare. Warriors fight wars. Koa fought in wars, but that didn’t necessarily make them warriors. The same thing went for these koa aloha ʻāina, from then until now. They are not warriors. They are a grove of trees. In these battles that often take place on protest signs and in newspaper articles and across social media, the words used to describe those involved are of the utmost importance. We see this now on a large scale when folks in the black community are described as “thugs,” “hoods,” and even “enemy forces.” I ka ʻōlelo nō ke ola, i ka ʻōlelo nō ka make. These words shape how the community at large responds to them, and we have seen that life and death can truly come from these words. In the case of the mountain, it plays out in whether the kiaʻi mauna are described as protesters or protectors, vandals, or illegal campers. Each of the ways that our koa are described carries the baggage and framework of English, a language spoken by people who didn’t always approach us humbly or with care for our culture. So we must remember what is at stake when we accept their labels rather than our own. In our language, “koa” is not used to describe those who fight in battles because it means “warrior”; it is used to describe those who fight in battles because it means “brave.” It means “courageous.” It is connected to the mighty koa tree here, and has a history of other trees called toa throughout Polynesia. Koa seeds can remain viable in the soil for twenty-five years or more. For them to germinate, they often have to be scarred or cracked first, yet they grow to amazing heights. There is a 115 ft tall koa tree in South Kona, and one in Kaʻū that measured 140ft. Koa also play an important ecological role as they fix nitrogen, cycle nutrients, and sequester carbon. They provide habitats for native birds and space in their understory for other native plants to grow, and their wood is used from everything from house timbers to canoes to surfboards to ʻukulele to weapons to calabashes. To grow through pain, sometimes from being broken, and then to give so generously of yourself, that is bravery and that is courage. That is koa. So it is not war that we have in mind when we use the word koa. Warriors can fight for justice, but too often nowadays they are invaders, going about the corporate-sponsored business of war. Our koa are defenders, growing from the land. The bravery and resilience of the koa tree undergirds our usage. Koa grows from adversity, damaged and scarred, to become one of the pillars of the forest, so when we call people koa, this is what we are talking about. Warrior is too flat for what our people are. Warriors rely on war for their existence. What a warrior knows is war. But what a koa knows is aloha. The koa on the mountain have even restored a certain sacredness to aloha by proclaiming its kapu. Too often aloha is cast about as something that we have to have for tourists, or something that means we have to keep quiet when the Department of Interior comes for their hearings, or something that you can buy or sell like gas or termite control. We have even been told that our aloha is a weakness! That aloha is why we “lost.” According to the people who say that, it was not because the foreigners who came in the nineteenth century never fully recognized us as human or because big business had too much influence even then. It was because we had too much love. Imagine that. The truth of it is we have never given up and aloha is the very force that has sustained us through generations of struggle. The koa holding fast to the kapu aloha have shown everyone the fierce and abiding mana that is rooted in our aloha. It is aloha that has stopped the trucks. It is aloha that has drawn tens of thousands of people to support the movement. It is aloha that will allow us to prevail.In fact, even if the mauna was not sacred before this (which is ludicrous, of course), the amount of aloha and hoʻomana expressed up there ensures that it is now. And that aspect of sacredness is something a koa would understand, but a warrior might not. People aren’t used to seeing a fight like this, where a recognition of the sacredness of ʻāina and aloha has replaced aggression. When the kiaʻi mauna insist on calling themselves “protectors” rather than “protestors,” it is not a crass and calculated media spin move to cast themselves in a better light. It is a call for people to pay attention to the difference between the two. Protesting is a powerful tool, but it does not define us. 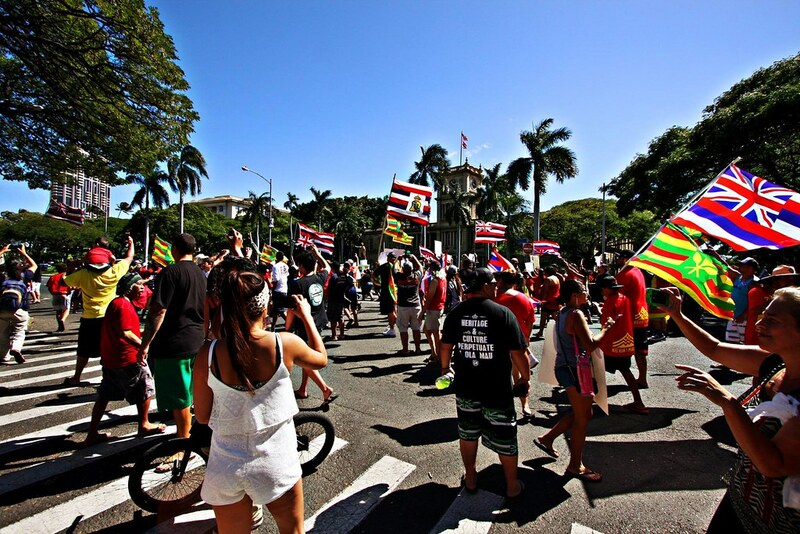 Protest can be motivated out of fear, anger, uncertainty, but protecting grows out of aloha. It involves quiet reflection and returning to your piko, wherever it may be, to understand your kuleana. It means putting your body on the line, on the side of the road, on bridges, on street corners, at the capitol, at the Kamehameha statue, in front of trucks and police. Standing up and speaking out when so many people are telling you to just go away, that you and your beliefs have no place in this world. Risking your job to answer the fire in your naʻau. Standing, shouting, chanting, writing, testifying, waving signs, making hashtags, learning new oli, sharing breath, even giving lei, all just to get people to understand that “sacred” means so much more than they think. It means that even though koa isn’t often found above 7,000ft, groves of koa grow on the summit of Mauna Kea. The koa aloha ʻāina in 1895 didn’t have training. Too few were soldiers. Yet they fought. Not because they were warriors, but because they were brave. Because they could imagine a world different than the one they were living in. When your whole education and every voice you hear from society at large tells you that you just have to accept “reality” or “that’s just the way things are,” it takes great courage to imagine something else. And that is the kind of courage these koa had. They imagined a world where Hawaiian values still guided decisions about Hawaiʻi, a world where business concerns didn’t dictate everything, a world where leaders actually stood for something. Those brave koa who have come before us give us the courage to imagine. More. To imagine what this world could be. A world where everyone understands the sacredness of land. Where we don’t have to use telescopes to find an escape planet. Where development and progress mean loʻi and fishponds. Where our language belongs everywhere. A nation doesn’t have to be structured on oppression and genocide. To imagine what it would be like if we all listened to the stones and the sea. Just to imagine. More. Each act of imagination plants a seed, and koa seeds remain viable in the soil for years, and as we have been seeing up on the mountain, for generations. One of the most beautiful things I have seen about this movement is that you never know where these seeds will sprout. So many people who would not consider themselves activists have been getting involved, waving signs, learning chants, watching hearings, and just becoming koa. For example, my mom is a fierce, formidable, and funny woman. She picked up surfing in her fifties, will shamelessly snake people’s waves, and kayaks to work instead of driving. She keeps an immaculate house, which didn’t all the way get passed down to me, and she used to scold me for not washing my car before driving my ʻōlelo Hawaiʻi teachers around. Of all the things that she is, though, activist is not one of the things that come to mind for me. But after the protectors got arrested in April, she has been reading everything that she can find about the issue. She used up all the data on our shared plan to stream all the court hearings and Board of Regents meetings. And when I told her about the island-wide Hoʻi i ka Piko summer solstice prayer, she told me that I better go so that I could represent our family (at 4am no less!). These were powerful moments for me because I was reminded that even though we hadn’t really talked about these kinds of issues before, many of the traits that make me so determined to carry on our language and traditions and stand up in these kinds of situations come from my stubborn, strong koa mother of mine. This is not an uncommon story these days. This movement has shown us that koa seeds are everywhere in the soil, waiting, regardless of age, and they just have to be inspired and nurtured the way all of us have been by the koa who have come before. Thirty one people were arrested on the mountain in April. This past week twelve more arrests were made. All these people’s names have been added to the list of koa aloha ʻāina. Some of them are my friends. Others I have seen around. 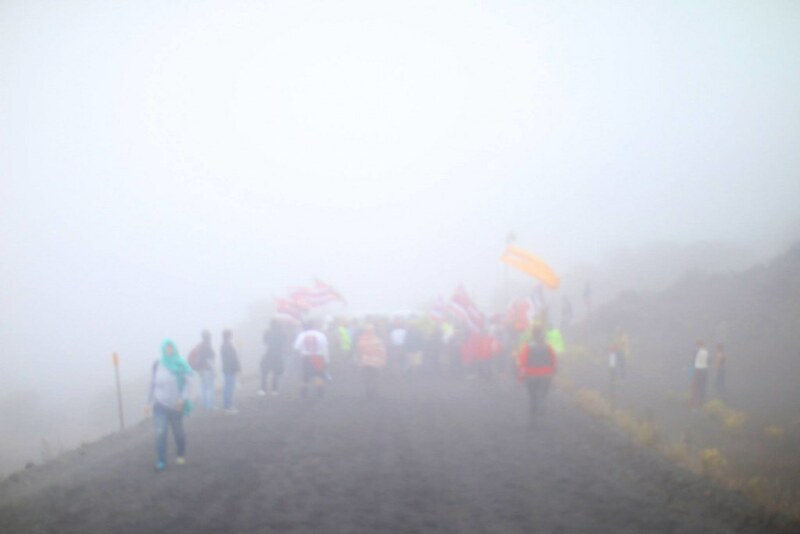 According to reports, at least 700 people gathered to kiaʻi mauna. Elders, parents, children, ancestors, all facets of our community. Even those of us who cannot make it up to the mountain all have our minds and our mana focused towards Mauna a Wākea. Groves of koa have been sprouting on the top of the mountain, preventing the TMT from going any further. Mauna Kea. Haleakalā. Hoʻopili. Nā Wai ʻEhā. The harbors at Nāwiliwili and Kaunakakai. There is old-growth koa on Kahoʻolawe, Kalama Valley, Waiāhole, Chinatown, and even older stands of koa at the palace. Koa have been growing at all of these places, sprouting on all of the islands, in all our communities, the young growing in the shelter of the old, providing a habitat for the manu and the mea kanu to thrive. This movement has caught all of us up in its embrace and helped many, both in and out of our community, see what it truly means to be a lāhui. We are all a part of this fight. But we are not warriors. We are a grove of trees. We are koa. And we will never stop growing. * This list was re-typed from Kaua Kuloko 1895, so if you wish to check the names for accuracy, please go to the original document. ** Mahalo nui to Leilani Lindsey Kaapuni and Andre Perez for supplying the complete list of these inoa hanohano no kēia mau koa aloha ʻāina. Mahalo nui. This movement has been all of those things to me as well. Mahalo iā ʻoe no ka heluhelu ʻana! I am glad you felt moved to comment. Aloha mai. My name is Z and I wanted to get in touch, regarding some sharing of mana’o and ‘ike. Mahalo nui for your article and your research. My great grandmother is Emma Kahuila Wilcox, a relative of Robert W. Wilcox, so I try to learn as much as I can about the iron duke. My research has characterized him as in opposition of Lili’uokalani as the queen. Robert Wilcox’s newspaper, The Liberal, clearly stated his opposition to the Kalakaua and Lili’uokalani regimes – primarily after he was setup by Kalakaua and wounded in his 1889 rebellion to restore the 1864 constitution. Sometime into Lili’uokalani’s reign, Wilcox seems to have lost faith in her capacity to be a good ruler. He has publicly stated that the last great monarchs ended with Kamehameha V.
Wilcox was an advocate for a republic, rather than a monarchy, and he had plans to be the first Hawaiian president. Days prior to the overthrow, Queen Lili’uokalani asked him to command the palace defenses and he refused to aid her. I’m interested to know if you have come across something that indicates, that around 1895 (his rebellion), Wilcox supported the reinstatement of the monarchy? As far as I know, his rebellion was a result of the disfranchisement of the Hawaiian people by the Republic of Hawai’i – in 1895, they were no longer the Provisional Government. Robert Wilcox had much aloha for his people and seems to have believed that the Hawaiian people could best be represented by a republic, rather than a monarchy. His 1895 rebellion intended to restore the Hawaiian people to political power. The Republic of Hawai’i was not the republic he had envisioned – it was oligarchy, not a democracy. I don’t intend for this response to be a distraction from the overall purpose of your article. However, there is often a parallel sentiment, or agenda if you will (not saying that that is happening here), that associates Hawaiian advocacy (or Kanaka Maoli advocacy) with the restoration of the Hawaiian Kingdom government. Unfortunately, in that narrative, the voice of a great many Hawaiians and the issues they had under a monarchical government is disregarded. Today, the paralleling of these narratives, has a divisive element and serves to disfranchise a great many Kanaka Maoli who do not want a return to a monarchical system of government, but do support Hawaiian agency and even Hawaiian independence. Maika’i no kou mana’i a mahalo nui loa. Mahalo nui, e Z! Yes, that is a tricky thing to get those nuances across in such a short section. It sounds like your research is way more indepth than mine, as I’ve really only read stuff around the 1889 and 1895 actions from the nūpepa, which is more about him than by him, and then the Nakanaela bio and Kaua Kuloko. My intent wasn’t necessarily to imply that Wilcox himself was of that mind, but that the overall aim of Nowlein mā seemed to be restoration at that point, as they had drafted a constitution with that as the goal. What I wrote doesn’t really cover the shift in attitude towards Nowlein later either (which is particularly ugly by the time Buke Mele Lahui comes out). I can’t speculate about Wilcox’s motivations, but he must have know about their desire to restore the queen, even though by most accounts, he joined pretty late. It’d be interesting to see what he thought at that point, and if you have any insight there, I’d love to hear it. That’s actually one thing that I really love about these blog posts is that people can comment on them, kind of like they used to in the nupepa, offering rebuttals or further information or variant moʻolelo. In fact, in this post itself, the list of recent arrestees was only completed when one of the kiaʻi mauna sent me the information after reading the post. I also agree with what you’re saying about mistakenly associating all advocacy with restoration of the kingdom. There is often a kind of myopia about that. I actually translated a set of articles for the last issue of ʻŌiwi that include Hawaiians supporting annexation as a way to protect Hawaiian rights because those rights were so limited by the Republic. I think it’s good to always complicate the received narratives that we get. I would also say though that I think that at least nowadays, invoking the queen is not always a tacit invocation of support for restoring the monarchy. Anyway, yes, thank you so much for writing. If you want to add a footnote explaining both Wilcox’s ambivalence about the monarchy and a bit about what you’re saying about not confusing Hawaiian advocacy with restoration of the kingdom, as people don’t always read the comments, I think it’d be great. It might be easiest to send to to hehiale@gmail.com. Let me know though. Mahalo nui, again, for your mana’o and the exchange of ‘ike – and I most-certainly understand what you’re getting at. Robert Wilcox was a very interesting guy and his shifting politics could either peg him as a madman or an incredibly determined Hawaiian patriot, highly adaptive and always fighting for the best interest of the Hawaiian people. It’s great that you mentioned Clarence and Volney of the Honolulu Rifles because they add to the seemingly ever-growing list of people who initially supported the Provisional Government, but ultimately rebelled against them in 1895. In my opinion, they, like Wilcox and so many others, were sold on a dream that never came to fruition, because that dream was actually a ploy of establishing a white oligarchical rule in the Hawaiian Islands. By the time these people realized the true intentions of those in the Provisional Government – the Republic of Hawai’i was made without them and the promises of a better government. Mahalo again for your mana’o, ‘ike, and this brilliant article. No footnote is necessary – it would only take away from the intended purpose of this work. But, if I may, I would like to message you on Facebook sometime and inquire about further research that you have done – in order to help mine own. Haha, yeah, I think Wilcox got called all of those things in his day! Yeah, and it’s interesting to see the kind of opposition that grew to the Republic. Have you read any of Julius Palmer’s stuff? I haven’t done much research into him or to check the veracity of what he wrote, but he was Liliuokalani’s private secretary at one point and was writing articles about post-Annexation Hawaii for the San Francisco Call (I think), but the stuff he wrote was really evocative, describing the atmosphere in Hawaii and the sketchy stuff that the Republic was doing, like deportations and the like. Anyway, nice to get in touch on here. I’ll check you out on Facebook right after I send this. Mahalo nui for sharing your ike and manao with me; it was a nice bonus to writing the piece. Oh, and mahalo also for the reminder about the switch from PG to Republic. I always forget about that because mele and moolelo, which are more my area of study, still keep up with the pig references for quite some time after the shift! Ahahaha, and I just noticed I had to edit it out of my earlier response to you even! Inspiring and moving. A light in all the darkness for all local and indigenous movements the world over. Thank you! Shucks, thank you for the nice comment! I appreciate it. Mahalo!